In May 2010, when Lynda Behan suggested that she and a friend get on their bikes and start a regular ride together, she had no idea that four years later she’d have 35 women who wanted to tag along, and Women of Oatley (WoO) would be born. I met Lynda at a women’s cycling discussion a couple of months ago and I was impressed by her passion and enthusiasm for encouraging other women to start riding. Back in 2010 it was her husband that encouraged her to start riding, because he rode with a local recreational riding group and thought Lynda should join him. Lynda took it one step further and invited her friend to join her on a ride around a local park and then gradually, two by two, other women began to join them. Oatley is a southern suburb of Sydney and Lynda and others are very fortunate to have a local park/reserve with a great cycle track but they’ve since ventured much further than their local area. In the early days of WoO, Lynda could already see the potential for a women’s only cycling group that was non-competitive and inclusive of all levels of riders, so she started a mid-week ride that suited part-time or women who didn’t work in paid employment , and a Saturday morning ride for those who worked full-time. As the interest grew, she started more rides and at that time she knew she was the key motivator so attended and led every ride herself. As a part-time higher education teacher Lynda was able to keep this up for a number of years but eventually got enough lieutenants in place so that she could appoint ride coordinators for each ride so WoO was not so dependent on just her. There are currently about 35 regular riders of various levels – some still just stick to the park ride, while most have advanced to riding regularly on the road. For those who want to take their cycling to the next level, Lynda and seven other WoO women have started racing. The WoO women have attended a number of bike skills events with two coaches who I also know well – Jenny Triggs & Donna Meehan and under their guidance have stepped up to try racing. They’ve joined Southern Cross Cycling Club. Communicate regularly – Lynda has deliberately kept her communication sources closed to the rest of the world by setting up a private email group for members. She sends out a weekly newsletter to her group and makes sure she mentions as many members as possible for their activities and achievements. 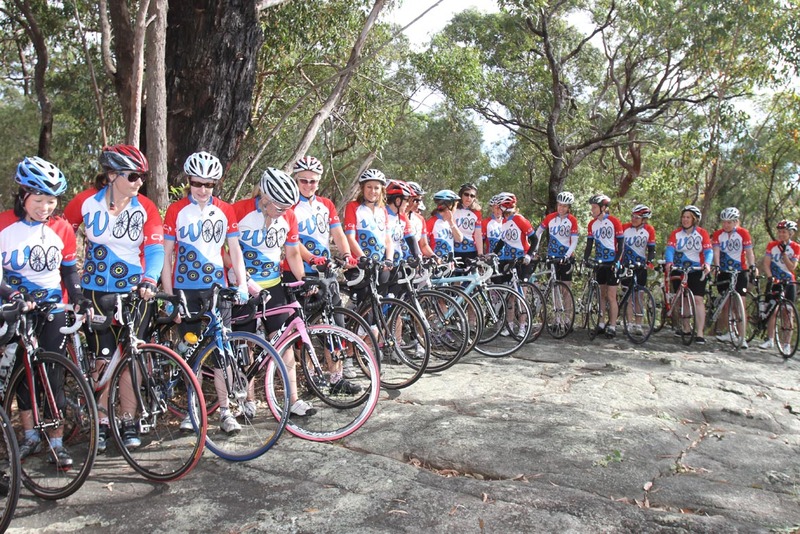 Create a good looking group jersey – the WoO women have produced a distinctive jersey that was designed by one of the members, and chosen from one of three designs by the members, and it gives them a feeling of belonging to a collective. Spread the load – Lynda found that after a few years she couldn’t be at every ride herself so she found other women who were willing to deputise and that’s meant she can increase the number of rides and free herself up as well. Cater to different levels – Lynda has never turned anyone away because of the type of bike they ride or their skill level. She has been able to create regular rides to suit all levels. Set goals – Every year at the Christmas social event Lynda asks each woman to set a yearly goal, she records it and then holds them accountable at the next event. Of course, there is no real pressure but she finds that once the goal is set, most step up to achieve it. Incorporate social activities – Obviously there’s the obligatory post-ride café visit but Lynda also organises other social activities to get the women together. Continually praise – Lynda has found that women particularly thrive on peer encouragement so she’s very big on continually praising her WoO girls when they progress. Develop a sense of community – Lynda says she often receives feedback from members about the great ‘family’ feel that WoO has achieved. Creating a community is key to getting women to cycle together. Well done Lynda. I’m hugely impressed with what you’ve achieved and I hope to emulate it myself. Lynda has also offered to answer questions from other women (or men) who are trying to get a recreational cycling group going. Just send me a message via social media or email and I’ll put you in touch with her. What an inspiring story! Congratulations on starting something so fabulous Lynda. Great story, good on you Lynda!! Nicola, would you mind help me to in touch with her email?